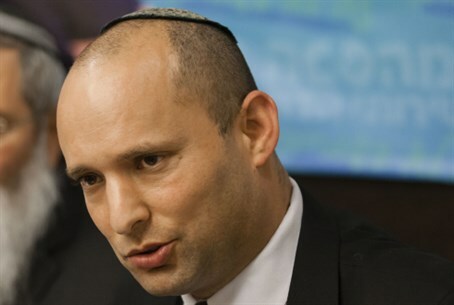 Habayit Hayehudi chairman Naftali Bennett says he’ll oppose the release of terrorists as a good will gesture for the Palestinian Authority. Bayit Yehudi party chairman Naftali Bennett says he’ll oppose the release of terrorists as a “good will gesture” prior to final status talks with the Palestinian Authority. Bennett, who serves as Industry, Labor and Economy Minister, made the statement Sunday morning ahead of the weekly Cabinet meeting during a Hebrew-language radio interview. “I would not free one murderer in exchange for the right to sit with Abu Mazen (the ‘nom de guerre’ of PA Chairman Mahmoud Abbas),” Bennett told Army Radio. “I will oppose the release of terrorists who murdered Jews as a gesture in advance of PA negotiations, and I believe Prime Minister [Binyamin] Netanyahu agrees that Israel does not have to accept any preconditions,” he said. A report published last week in the London-based Al Hayat newspaper claimed U.S. Secretary of State John Kerry is calling for the release of 103 PA terrorist long-term prisoners jailed prior to the signing of the 1993 Oslo Accords within six months of the start of negotiations. The Hebrew-language NRG website reported last week that the government was considering the possibility of releasing 40 PA terrorists in advance of talks as a “good will” gesture. But the PA has not committed itself to negotiations even after the release, and both Netanyahu and Kerry are reportedly awaiting Abbas’s response to the proposal. Another 64 terrorist prisoners would reportedly be released graduation as negotiations progress under the plan.